Turquoise & Brown Beads Necklace. 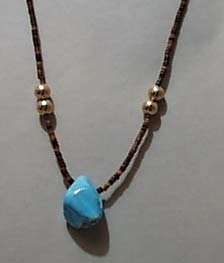 This is a 18" turquoise and brown bead necklace. There is one nice sized turquoise stone on the center of the necklace. The necklace is made from small brown beads . 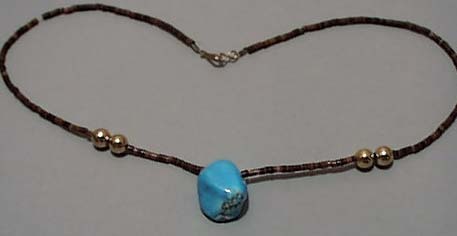 Approx 2" from the stone on either side are two gold tone beads that really give it a nice look. This stone measures approx. 1" long and 3/4" across. A very pretty light blue stone. I would guess this is from the 1980's. In mint condition. Items Similar To "Turquoise & Brown Beads Necklace"